Reza Sahba is a registered patent agent focusing on the preparation and prosecution of patent applications. Reza worked for 15 years in various engineering positions, with extensive experience in the automotive industry. His primary background is in automotive electronics and embedded software. Prior to joining Bejin Bieneman, he worked on camera-based Advanced Driver Assistance Systems at Magna Electronics. During his prior employment with Robert Bosch GmbH in Stuttgart Germany, he gained extensive experience in vehicle body electronics and vehicle communication networks. Reza worked on combustion engine control systems while working for Continental Automotive in Regensburg, Germany. 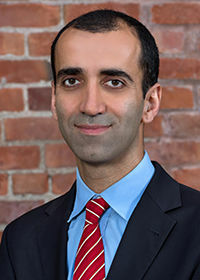 Reza is a graduate of University of Stuttgart (M.S., Communication Engineering and Media Technology, 2002) and Isfahan University of Technology (B.S., Electrical Engineering, 1999). Reza is a multilingual professional fluent in English, German and Persian.